The first systematic, multidisciplinary results to come out of research conducted on the edge of the Serengeti at the rich palaeoanthropological site in the Olduvai Gorge in Tanzania since that produced by Louis and Mary Leakey's team, have recently been published in a special issue of the prestigious Journal of Human Evolution. Professor Marion Bamford, deputy director of the Bernard Price Institute for Palaeontological Research, and Professor Ron Clarke from the Institute of Human Evolution – both at the University of the Witwatersrand – contributed papers to the 191-page special edition. Bamford and Clarke's contributions are part of 15 papers by 25 scientists to have come from research conducted by the Olduvai Landscape Paleoanthropology Project (OLAPP) since 1989 and the special edition is entitled Five Decades after Zinjanthropus andHomo habilis: Landscape Paleoanthropology of Plio-Pleistocene Olduvai Gorge, Tanzania. "The significance of this special edition is the culmination of the work we have been doing at Olduvai the past two decades and is an impressive range of articles that deals with various aspects of our distant ancestor Homo habilis." "No one site tells us more about the last two million years of human evolution than Olduvai and with contributing researchers from Wits University, this collaborative work dispels the suppose rift in palaeosciences between East Africa and South Africa," says Professor Robert Blumenschine, guest-editor of the special edition and Chief Scientific Strategist of the Palaeontological Scientific Trust (PAST), based at Wits. Bamford and Clarke are also associated with and supported by PAST which provides funding to members of the OLAPP team, including to the local excavators and technicians supporting the research in Tanzania. "The publication celebrates the 50th anniversary of the Leakey-discoveries in 1959 and 1960 of the Zinjanthropus (now known as Paranthropus boisei) and Homo habilis type species. The Leakey's work, spanning five decades until 1984, established Olduvai as the single most important record for hominid biological and technological evolution over the last two million years," Blumenschine says. Bamford's paper entitled Fossil sedges, microplants, and roots from Olduvai Gorge, Tanzania, and her collaborative paper with Rosa Albert entitled Vegetation during UMBI and deposition of Tuff IF at Olduvai Gorge, Tanzania (ca. 1.8 Ma) based on phytoliths and plant remains, provide the first systematic report of plant fossils from Olduvai. Together, these papers show the great potential plant fossils hold for high resolution palaeoenvironmental reconstruction of the habitats used byHomo habilis at Olduvai. Clarke, who has worked closely with the Leakeys in the 1960s, gives in his paper entitled A Homo habilis maxilla and other newly-discovered hominid fossils from Olduvai Gorge, Tanzania, a full description of the Olduvai Hominid (OH) 65 palate, the first complete upper dentition of Homo habilis. This specimen provides crucial evidence for redefining Homo habilis. 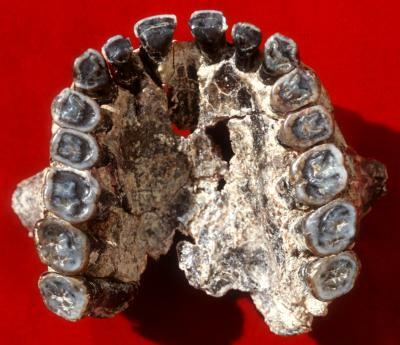 Clarke also describes the specimen OH 7X, that is the previously missing right second molar of the OH 7 mandible discovered by the Leakeys 46 years earlier, and used by them to originally describe the species Homo habilis. 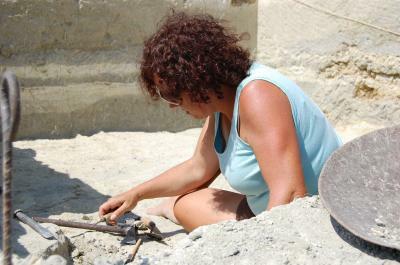 OLAPP researchers have in the past two decades departed from the tradition approaches in palaeoanthropology and have conducted multidisciplinary excavation over broader areas – distances spanning 20km – to provide more detailed environmental and ecological context to their research. OLAPP focused on the earlier, 2.0 - 1.8 million year old parts of the Olduvai sequence during which time Homo habilis existed. It was the first species of our genus and the first human ancestor to exhibit brains larger than apes, stone tool making and use, and consumption of meat and other foods from large animals. OLAPP's objective has been to understand the ecological pressures that selected for these fundamentally human traits. A number of papers in the special issue describe the novel methods employed to achieve this goal, which featured excavation of a large number of trenches from single discrete time intervals over landscape scales (hundreds to thousands of meters). Detailed study of these sediments, fossil plants and animals recovered from the excavations allowed OLAPP scientists to place the stone tools and butchered animal bones also recovered in a very high resolution palaeoenvironmental context. Blumenschine, a Professor of Anthropology at Rutgers University, USA, was assisted in guest-editing the special issue by Fidelis Masao, from the University of Dar es Salaam, Ian Stanistreet, from the University of Liverpool, and Carl Swisher, also from Rutgers University. Blumenschine also contributed various papers to the special issue. PAST is Africa's Origin Sciences champion. PAST is a South African NGO that since 1994 has been promoting and preserving southern Africa's rich fossil heritage through seven successful programs that integrate education, research, and public outreach activities in the origin sciences (see www.past.org.za). No other institution in Africa - and indeed in the world - shares this mission, and PAST is universally recognized as the most important independent source of support for origin sciences research and education in southern Africa. PAST's newest initiative, Scatterlings of Africa, of which Clarke and Bamford are founding members, is an ambitious effort to expand the organization's mission across Africa while retaining its traditional core focus on southern Africa. Scatterlings is a powerfully transformative idea that instils pride in Africa as a treasure trove of human heritage, while fostering a more positive perception of the continent previously mired in biases based on superficial differences such as skin colour. It is an educational concept that inspires scientific curiosity among learners and fulfils humankind's fundamental need to understand its roots and diversity.